ICT solution and service provider aamra companies established network point of presence (PoP) at Interxion’s data center in Marseille, France. 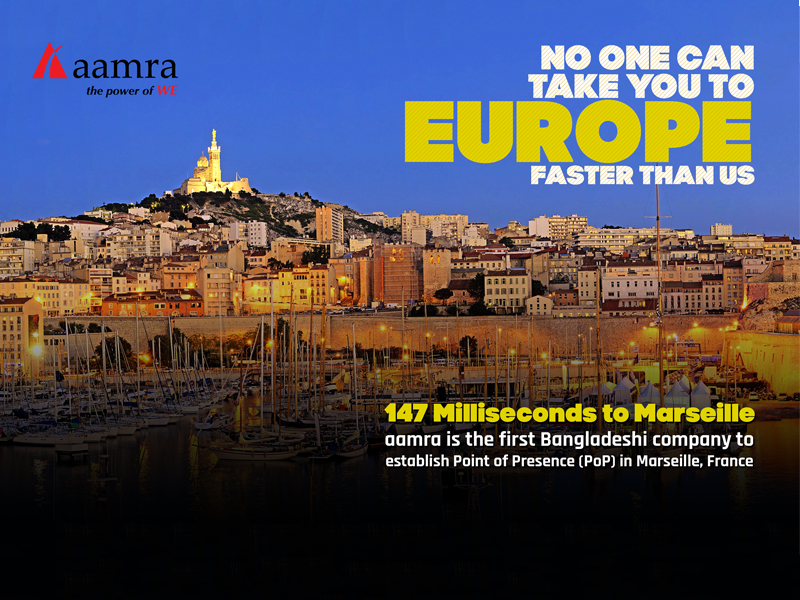 aamra is the first Bangladeshi company to establish a PoP in Marseille. The company expanded its network to accommodate the growing demand in traffic between Bangladesh and Europe through Interxion, the European provider of carrier and cloud-neutral colocation data center services. As Marseille is a gateway between Europe, the Middle East, Africa, and Asia, aamra ensured network presence in the city. On January 2019, aamra established PoP within Interxion’s Marseille campus to provide connectivity to a pair of submarine network systems on the city’s shore. Interxion Marseille campus, the gateway to Europe has a significant connectivity legacy. It houses 140+networks, 30+ backhaul providers, 80+ International networks, 14 Submarine Cable systems, 11 CDN and Content Platforms and 4 Internet Exchanges. It has 160Tbps potential capacity connecting 43 countries around the world.